August 5, a conglomeration of the day’s wacko holidays! American Bandstand went national on August 5 in 1957. In 1930 the first man to walk on the moon, Neil Armstrong, was born on August 5. And on August 5 celebrates Underwear Day, Beer Day, Pony Day and Pepper Day. August 5th is also the anniversary of the placing of the first cornerstone for the base of my favorite statue, the Statue of Liberty. 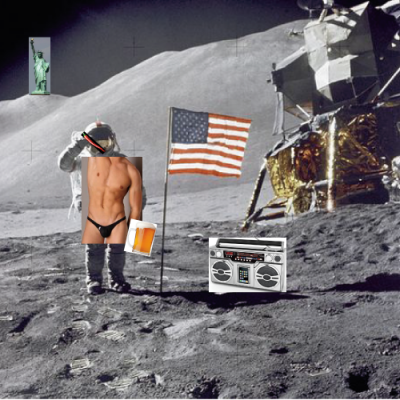 Here we see Neil Armstrong in his underwear, drinking a beer to cool his throat from a hot, hot pepper he’d eaten while dancing the Pony as American Bandstand plays on his boom box, as Lady Liberty looks on (and laughs).